Steak ‘n Shake, home of the Original SteakburgerTM, has some exciting news! They've just announced three new delicious items for their Summer Menu: the Bacon ‘n Cheese Triple Xtreme Steakburger, the KIT KAT® Milkshake and the Strawberry Cheesecake Milkshake. I started craving the strawberry cheesecake milkshake made with real strawberries and pieces of cheesecake as soon as I heard about it. For those who aren't already familiar with Steak 'n Shake, they are famous for their delicious hand-crafted, premium burgers and hand-scooped milkshakes. I fully expect these latest menu items won't disappoint! 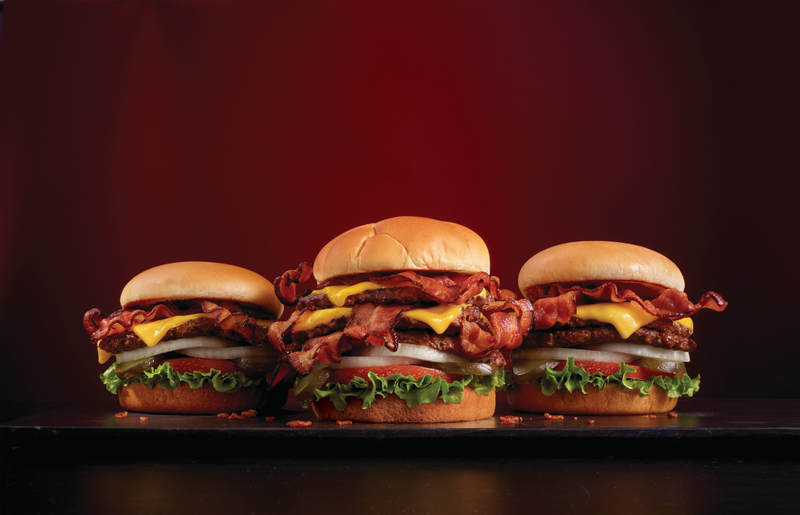 Bacon ‘n Cheese Triple Xtreme Steakburger: Featuring nine half slices of Steak ‘n Shake’s new, ultra-premium hardwood-smoked bacon that is larger, thicker and more flavorful than ever. The three hand-crafted, 100% beef steakburger patties are topped with two slices of Steak ‘n Shake’s new, thicker American cheese. **For those who may not be able to handle the Xtreme factor of this burger, Steak 'n Shake also offers two other sizes: the Bacon ‘n Cheese Double Steakburger served with fries for $4.99 and the Bacon ‘n Cheese Single Steakburger served with fries for $3.99. Great deal! KIT KAT® Milkshake: Made with KIT KAT® lovers in mind, this hand-scooped milkshake is blended with a generous helping of the famous crispy, milk chocolate wafers, topped with whipped cream and a cherry. Strawberry Cheesecake Milkshake: This hand-scooped milkshake, topped with whipped cream and a cherry, is blended with real strawberries and cheesecake pieces, fitting Steak ‘n Shake’s standards for quality ingredients. If you're new to Steak 'n Shake, you're in for a treat. The decor alone has that throw-back diner feel we love. Steak ‘n Shake puts quality above all else, including using 100% beef without preservatives or artificial ingredients, as well as fresh produce, always hand-crafted to order. They source, slice, grind, and provide the freshest and choicest quality ingredients available for all of their menu options. Better hurry because these summer menu additions may only be available for a limited time. Click here to find a Steak 'n Shake location near you. Have you tried the new menu yet? If so, we'd love to hear what you think! Comment below or share with us on social media!